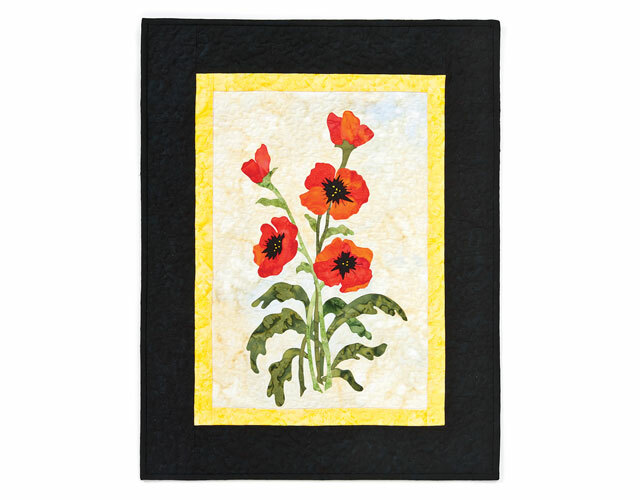 Join Quilter's World magazine editor Carolyn Vagts as she teaches an innovative quilting technique for machine applique while creating a beautiful quilted poppy wall hanging! Find out more in the Class Description below. Adding those special extra adornments that truly make your applique quilt creation one of a kind! As you watch this fusible applique technique, you can practice each step along with Carolyn as she makes a beautiful poppy wall hanging from start to finish. Class materials include the complete pattern instructions and pattern pieces which students can download and use over and over again. This class is suited to advanced beginner- to intermediate-level quilters. This is beautiful. Thank you. Good pattern and through instruction. I want to try it in redish-orange-more on the red side. I am anxious to make it but I am ill right now. This was a lovely class with good instructions. I feel confident that I can make this project. Carolyn has a great teaching method, that is clear, concise and easy to follow. I now feel quite confident enough to put what I have learnt into action, and inspired to use these techniques to create my own designs as well. Tenfold back for money well spent. I so enjoyed this class and cannot wait to make the beautiful wall hanging. After taking this class I feel so confident that I can do this. Thank you so much, Carolyn Vagts. You are awesome. I really enjoyed the class! Instructor was great. I cannot wait to complete project. Great job.